The VBeam laser is a pulsed dye laser, which means that the laser energy is delivered in pulses and a dye is used to generate laser beams of different colors. Since the VBeam is used to treat dilated blood vessels, as in rosacea, it is often called a vascular laser. The laser targets blood vessels, in effect, cooking them, without causing any significant damage to the surrounding areas. In severe cases of Rosacea, 3-5 treatments may be needed, each treatment being one month apart. The usual cost for each treatment is $400-500. 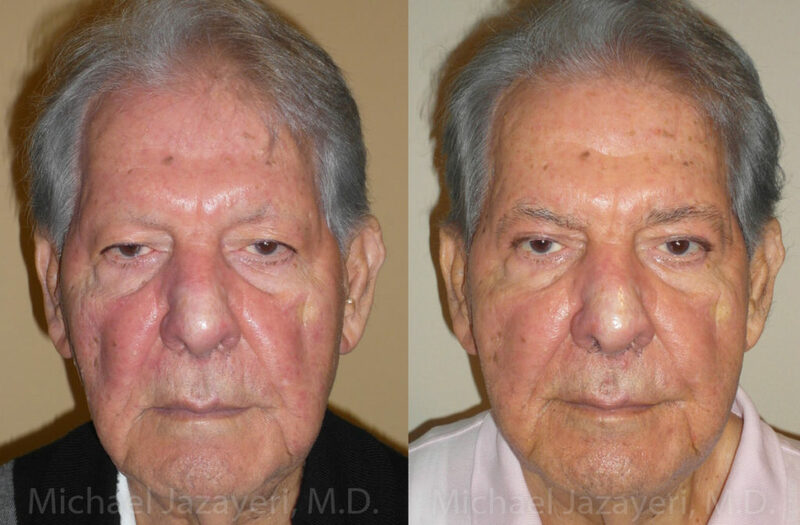 This patient with noticeable Rosacea is shown after three treatments with the VBeam laser. There is a significant improvement in the redness of the skin. It is critical for the patient to avoid or minimize sun exposure and any food or drinks which exacerbate the Rosacea for that patient. The procedure is done in our office and no general or oral anesthesia is required. Michael A. Jazayeri, M.D. is a board certified plastic surgeon with over 17 years of experience. Our office is located in Orange County, California. To schedule a complimentary consultation, please call 714-834-0101.